Aeronautical Charts: There are aeronautical charts for Alaska, but the State of Alaska does not produce them and there are a couple reasons for this. First the FAA has a regional office devoted solely to Alaska because Alaska is so large, while most FAA regional offices cover several states. Second it takes a total of sixteen sectional charts to cover the entire state, and these aeronautical sectional charts are already produced by FAA and available from several national vendors, or the FAA National Aeronautical Charting Office (NACO) Online, or through fixed base operators in Alaska. Similarly the Airport Facilities Directory for Alaska is the Alaska Supplement to the United States Government Flight Information Publication produced by FAA. This and the US Terminal Procedures, Alaska booklets and Anchorage/Fairbanks Terminal Area Chart are generally available wherever aviation charts are sold including FAA NACO Online. Therefore the State of Alaska does not produce a facilities directory as most states do. Liability of pilots/owners: Alaska statute, AS 09.65.112(a), says "An owner or operator of an aircraft or watercraft is not liable for the civil damages of a person being transported in the owner's or operator's aircraft or watercraft if the aircraft or watercraft is not being used for commercial purposes." Liability for "Certain airfield owners and operators" in Alaska, Alaska Statute 09.65.93(a), was amended in 2008 to read "(a) Except as provided in (c) of this section, a person who without compensation owns, operates, constructs, maintains, or repairs an aircraft runway, airfield, or landing area may not be held civilly liable, except for an act or omission that constitutes gross negligence or recklessness or intentional misconduct, for the injury to or death of a person or for damage to an aircraft, resulting from the use of the runway, airfield, or landing area to take off, land, park, or operate an aircraft." FAA is re-assigning Common Traffic Advisory Frequencies (CTAF) in the Matanuska and Susitna (Mat-Su) Valleys to improve situational awareness and clarify frequency use. Effective May 29, 2014, individual airport CTAFs are being assigned within the Designated CTAF Areas depicted on the attached graphic. 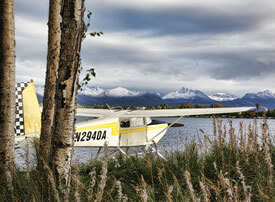 Pilot Employment: The State of Alaska employs very few pilots directly. The Department of Transportation & Public Facilities does not hire any pilots. The Division of Forestry in the Department of Natural Resources and the Alaska State Troopers a division of the Department of Public Safety hire a few pilots. However pilot requirements for both agencies vary and usually involve a minimum of 1,500 hours of Pilot-in-Command time to be eligible. State of Alaska owned/leased aircraft: The State of Alaska has 60 aircraft located in four departments. The Department of Fish & Game has 16 aircraft, Department of Natural Resources has 5 aircraft, Department of Public Safety has 38 aircraft, and Department of Transportation & Public Facilities has 1 aircraft.